When Anton Chan left New York City in 2004 after having lived here for thirty years, she admitted that she did not know what was in store for her. Back in the Philippines, she immersed herself in the philanthropic activities spearheaded by her sister, Nene, and in her own artistic endeavors, taking art classes and promoting the heritage and culture of her hometown of Iloilo through her role as board member of Museo Iloilo. It didn’t take long before all of Anton’s private interests and civic activities merged—her interest in art, which had always been a part of her even as a young girl, inspired her to create art, and her philanthropic spirit motivated her to use her work to help those in need. Last year, Anton donated all the sales of her paintings and note cards made from them to the One Meal Program, which feeds underprivileged children in Iloilo. Last Monday, March 24, saw Anton once again using her art as a means towards an end close to her heart. With Museo Iloilo as the beneficiary, Anton Chan launched “In the Country,” an exhibition of 25 of her paintings at the Philippine Center in New York City. The exhibit was opened by Consul General Mario L. De Leon of the Philippine Consulate – New York and Mrs. Remedios Fe Cabactulan, a member of the Philippine Center-New York Art Committee and wife of Ambassador Libran Cabactulan, Philippine Permanent Representative to the United Nations. In her short speech, Anton dedicated the show to her late father, the late Antonio Chan, who she says was her greatest supporter. Surely this father must be beaming at the positive outcome of his support! It was a delightful evening. The art was lovely—reminiscent of the many places the well-traveled Anton has visited and vibrant with the colors of her hometown. There was a lot of food and laughter, and from the number of paintings marked with red dots, Museo Iloilo was a winner. 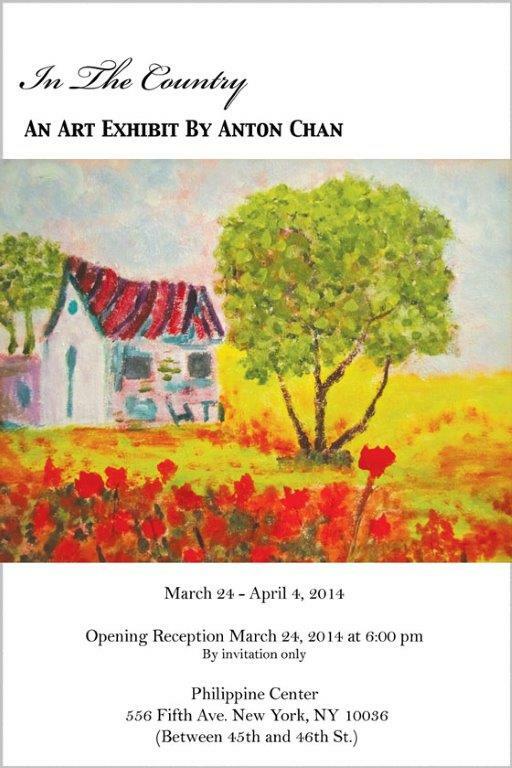 The exhibit will run until Friday, April 4.